One of the greatest things about vehicles is their trunks. Whether you have a sports car with a small trunk, or an SUV with a massive space, trunks provide critical storage area. Thanks to trunks, you can use your car for a lot more than just transportation and fun. You can transport groceries, carry around luggage on a trip, store your RC cars or whatever you need in your car. The danger with trunks is that, like a closet with no shelving, they’re a large area with no way to organize or efficiently store things. If you put too much stuff in your trunk, it can become a jumbled mess, like a teenager’s bedroom. Of course, everyone’s also experienced that moment where you put things in your trunk, thinking they’re decently organized, and then, after a few turns, and some brake pedal use, suddenly the trunk is a disorganized pile. Thankfully, trunk organizers exist. Trunk organizers don’t get enough attention, but they’re wonderful products, and we’re not afraid to admit that we use them a lot. Trunk organizers can work great for organizing items that you like to keep in your vehicle at all times. Or they can be used for returning home with that large Costco run, or sorting objects during road trips. Whatever your reason, trunk organizers can completely revolutionize the way that you pack things in your trunk. The market is saturated with a million and one trunk organizers, so it can be a little daunting to purchase one. But have no fear: we’ve made the process easier for you. What follows is a list of our favorite trunk organizers for cars. There’s a little something for everyone and every trunk here, so you can surely find the trunk organizer that is perfect for you and your car. Drive Auto Products is known for making some great car accessories, and this trunk organizer is no exception to the rule. Like many organizers, this product has straps that can attach to your trunk hooks. Unlike most products, the straps work wonderfully well with this organizer, and keep it standing upright at all times. The 13 stiff plates in the base also help it retain that structural rigidity, even when you’re driving around turns hard (and trust us: we drive hard). With two large pockets, eight smaller mesh side pockets, and foldable elements, we found that the Drive Auto Products Car Trunk Storage Organizer with Straps could hold and organize just about anything we had for it. We especially love that it perfectly fits a front seat (with the straps running around the back of the seat to hold it in place), so that when you don’t need a trunk organizer, you can have a perfect cabin organizer. More than anything, we loved the durability of this model. This is the ideal cargo organizer for SUVs, because it can withstand all the punishment that kids, road trips, and heavy usage will supply. Whatever we threw at the Drive Auto Products model, it handled with aplomb. If the size of this organizer is right for you, you really can’t go wrong here. Autoark is one of our favorite companies for car accessories, so it’s no surprise that their Multipurpose Car SUV Trunk Organizer is one of the trunk organizers that we like the most. While this is a standard sized organizer, it can hold a deceptive amount of items, due to its height and design. And since it’s an incredibly durable material, and waterproof, it’s pretty much a buy it for life item (plus, being waterproof makes it incredibly easy to wash). Don’t believe us? Autoark offers a lifetime warranty for this trunk organizer. Our favorite feature of this organizer is the two removable sub-dividers, which allow you to create multiple compartments for maximum organization, or leave the item as one large area. 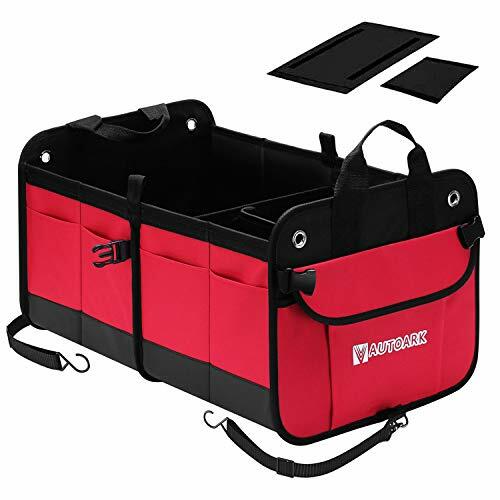 However, the coolest feature is that this organizer has handles, and folds up, so you can essentially use it as a shopping bag when you go to the grocery store, then place it in the trunk for the ride home. If you’re looking for practicality and adaptability, it’s really hard to beat the Autoark Multipurpose Car SUV Trunk Organizer. Of course the 12 compartments that this organizer has need to be mentioned. If you need to keep a lot of small items organized, you’ll be excited about this model – we certainly are! This organizer is available in multiple colors, so you can stay stylish, and for a few extra bucks you can purchase a version that preserves heat. Either way, you’ll love this model. If you’re looking for style with your organizer, look no further than this Sachi trunk organizer. Simply put, this is as aesthetically pleasing as you’ll find in a trunk organizer. That said, aesthetics aren’t really the driving factor when most people buy a trunk organizer. However, there’s no reason to worry: pretty or not, the Sachi trunk organizer is fantastic, and far and away one of our favorites. The main thing we love about this model is simply how practical it is. This is a trunk organizer with a cooler, which makes it not only great for trips to the grocery store, but also for road trips and picnics. 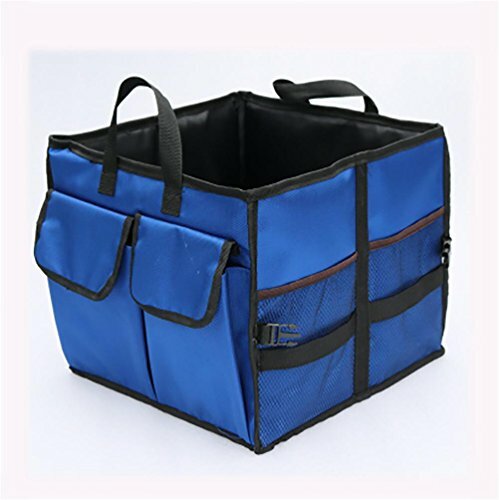 Furthermore, the organizer folds up so that it’s easy to carry; if you are just using it as a cooler in the vehicle, you can then carry it around like a shopping bag. We really loved that feature, and took advantage of it on more than one occasion. We found out the hard way that Sachi isn’t lying when they say the cooler is leak proof. 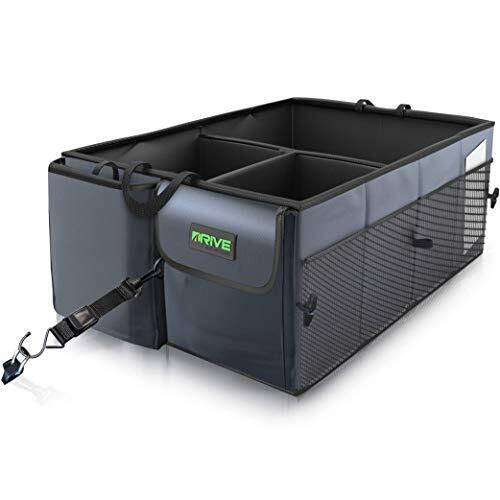 While we don’t recommend testing this feature, it is great to know that it exists, and makes it that much more practical if you want to use the cooler in this trunk organizer. As this model only has three compartments, and doesn’t attach to anything, it’s not ideal for organizing clutter and small items. But for shopping and long trips, the Sachi trunk organizer is as close to perfect as is possible. The OxGord Auto Trunk Storage Organizer Bin with Pockets is one of the more affordable SUV trunk organizers available. While it’s not the best organizer available, it serves its purpose well, and the price cannot be beat. Our favorite thing about the OxGord model is the fact that the three storage compartments are adjustable, so you can make the trunk organizer best optimize your available space. The compartments are large and very practical, and there are excellent mesh pockets along the outside of the product, making it a top-quality mesh trunk organizer. The biggest downside with the OxGord trunk organizer is that it doesn’t have any way of staying in place. The organizer is strapless, and doesn’t have a Velcro or sticky base, to hold it firmly in place. Add in the light weight, and you have to really fill up the organizer with a lot of objects to ensure that it stays where it is. While working the brakes or the steering wheel hard, we found that this organizer didn’t always keep items upright. Other than that small gripe, we have no problems with this great model. It’s listed as waterproof, though it doesn’t feel like the most durable item, so it may not be a great idea to test just how strong and waterproof it is. 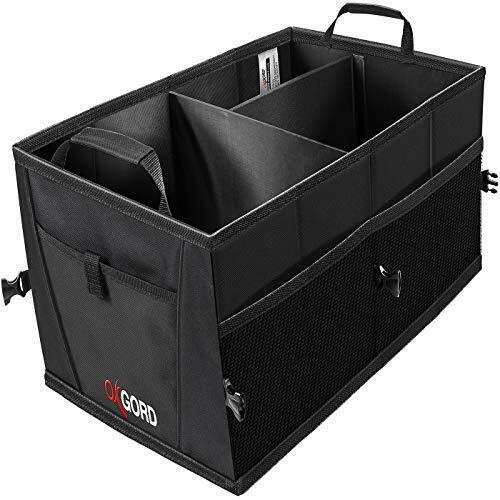 Still and all, the OxGord provides excellent organization for your trunk, whether you’re buying groceries or storing a fix-it kit in your trunk. For the price, you can’t beat this model. The KangoKids trunk organizer is unlike any other model that we’ve tried, but it’s absolutely brilliant. Rather than sitting on the base of the trunk, this model hangs from the headrests on the back seats. This design not only allows the model to cover a lot of ground (it’s roughly three and a half feet long) without creating excess clutter, but it also provides security, as the organizer is attached at all times. With four huge, deep compartments, this mesh trunk organizer can easily organize everything from a hefty grocery store run, to a family day at the beach. If we’re being honest, once we installed this model, we never took it down. It doesn’t take up commonly used space when it’s not in use, and you never know what you’re going to need it for. With strong and waterproof material, this organizer is about as durable as they come. You can wash it out easily and safely, and we put some seriously heavy groceries in the compartments, without any signs of wear and tear. We also loved that the KangoKids model is easily adjustable, so whether you have a small car or a large SUV, and regardless of the headrest size, it’s easy to make this model work. Ultimately, it’s a much different design than everything else on this list, but we really love it. Plus, there are two sizes to choose from, so you can find the perfect model for you. If you’re in the market for a pink trunk organizer, well have we got good news for you! 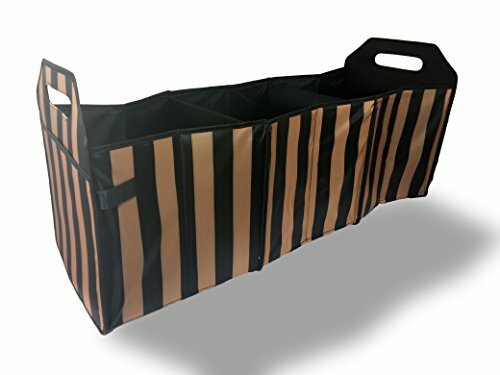 The TOCHENG Foldable Cargo Trunk Organizer is one of the most bright and exciting trunk organizers on the market, available in pink, orange, red, or blue (yes, black is also available, for you boring people). As much as the vibrant colors may make this trunk organizer seem gimmicky, it’s anything but: it’s a terrific SUV or car trunk organizer. This is the most expensive trunk organizer on the list, by quite a bit. Then again, as we always say: you get what you pay for. The TOCHENG trunk organizer is as durable as they come with top-quality Oxford cloth that is strong and resilient. This model is one large main compartment, with small side compartments. If you’re looking for something with numerous compartments to organize the minutiae of your car, then this probably isn’t the right one for you. But for carrying large amounts of groceries, clothing, or most other things, it’s quite perfect, and very large. Our favorite thing about the TOCHENG Foldable Carge Trunk Organizer is that it easily folds up into an easy-to-carry bag with handles. We loved using this organizer almost as a duffel bag. It takes up virtually no space when folded up, so you can bring it with you anywhere. Then you can load it up, and the extremely strong handles allow you to carry it safely and securely, even when it’s full of items. In other words, you can go from house to car and back again with great ease. Or, put another way: we absolutely love this product. There’s a pretty big overlap between car lovers and golf lovers (we think that’s because both golf and cars are nearly flawless). If you happen to be part of that group, then this is for you. The Samsonite Golf Trunk Organizer is the perfect car or SUV trunk organizer for anyone who regularly plays a few rounds. The Samsonite Golf Trunk Organizer doesn’t hold your golf clubs, but it holds everything else you need when you hit the green, including up to three pairs of shoes. This organizer is incredibly tough and durable, as any good golf bag should be. Our favorite aspect, however, is the mesh front door, which can help keep your shoes, socks, and gloves aerated after you’ve played, and they’re damp. That way, you avoid mildew, molding, and funky smells on your golf equipment. The organizer is also highly adjustable so you can make it fit whatever equipment you’re bringing to the links. And with lots of small compartments to hold things like tees, scorecards, pencils, and sunscreen, you’ll be able to keep all of your equipment well organized and easy to find, even if you have a lot of it. 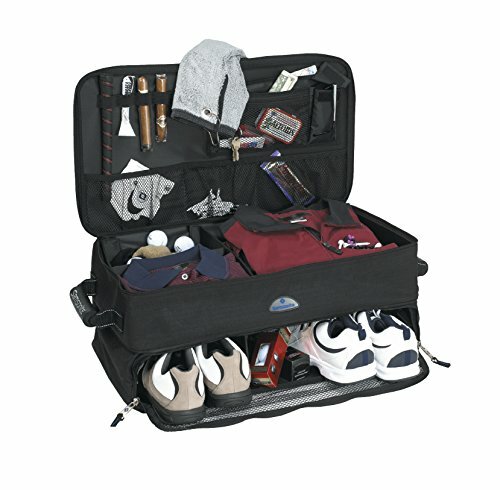 After using the Samsonite Golf Trunk Organizer, we won’t go golfing without it. Golf is a terrific sport, but you need organization. And this organizer provides that, beautifully. The Red Earth Naturals Premium Trunk Organizer is far and away one of the top cargo organizers for SUVs available on the market. 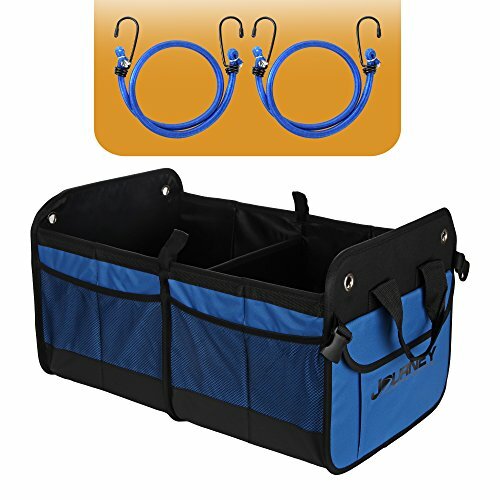 Pretty much anything you would want a trunk organizer to do, this product does. Our favorite element of the Red Earth Naturals organizer is how well it stay in place. This model is built with both rubber feet, and Velcro strips, to help it stay firmly in its spot. However, if that’s not enough, two bungee cords are also included, so the model can easily be secured to the vehicle. We learned to trust valuable and fragile objects in this organizer, from laptops to eggs, and we were never disappointed. Of course, an important part of any organizer is, well, the organizing, and this model really excels in that area, as well. There are two main compartments in this organizer, as well as 11 side pockets. The main compartments are very large, making this organizer great for trips or grocery runs, and the 11 pockets ensure that you can organize just about anything. Plus, if you don’t need the organizer to be as large, at can fold up to half size, and can then be placed in the front seat of the vehicle. The Read Earth Naturals Premium Trunk Organizer can also fully collapse, so it takes up virtually no space when it’s not in use. Add in an incredibly durable and waterproof build, and we struggled to come up with anything we don’t like about this spectacular car trunk organizer. Trust us: you won’t be disappointed with this one. As this list shows, there are a lot of different trunk organizers on the market, and they each offer different strengths and weaknesses. There’s no one perfect organizer, because so much depends on your preferences, your vehicle, how much you’re willing to spend, and what you intend to use your trunk organizer for. Before purchasing a trunk organizer, think about what you want in an organizer. Are you looking for something to help you declutter your vehicle staples? Do you want something for shopping trips, or for picnic dates? Strongly considering everything you intend to use your trunk organizer for can help you make an informed and successful decision. A car trunk organizer can make all the world of difference. 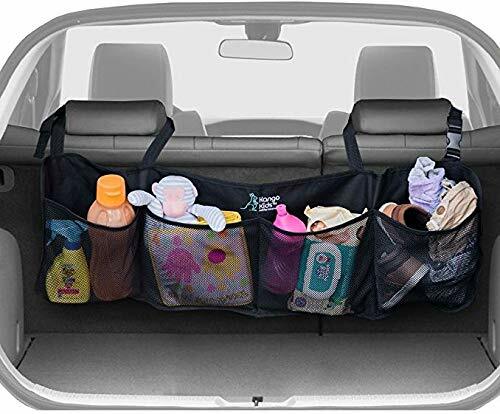 Whether you keep books and kids toys and tools in your trunk that you need organized, or you’re simply tired of your groceries falling all over the place while you drive, a trunk organizer will revolutionize the cleanliness and order of your car. We love all of the models in this list, and we’re sure you can find a perfect one for you.